Gotham mid-season finale ended with a bang. James Gordon, and Harvey Dent target Gotham’s elite in the mid-season finale. The fall back is that James Gordon is sent to Arkham Asylum to work as a prison guard. The episode Rogue picks up Gordon’s storyline in Arkham Asylum and introduces an important potential ally. Jim Gordon is a security guard at Arkham Asylum and no longer a member of GCPD. Inmates are being murdered with electric shock treatments. Gordon meets a doctor who shares his empathy of proper medical treatment for the inmates. Gordon decides to call in his former partner to help him in his investigation and all signs point to the warden. Gotham introduced Dr. Leslie Thompkins tonight played by Morena Baccarin. She is an ally to Batman and Gordon in the comic books. She is actually has been written as young Bruce Wayne’s psychiatrist. 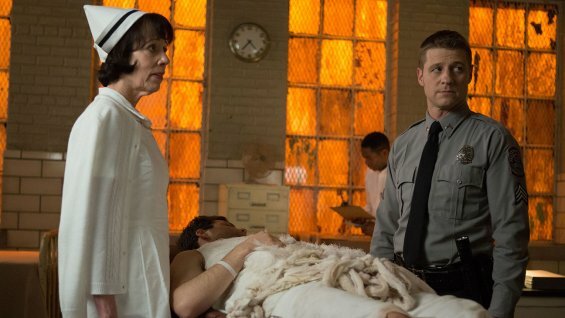 Thompkins in the Gotham storyline works at Arkham as a medical doctor. She and Gordon had some moments of flirtation. Honestly, that might be the best thing for a future Gordon storyline. Baccarin is a wonderful talented actress who can be a strong female presence on the show. Gotham doesn’t have a strong female character. The villain also had strong spotlight tonight. First, Penguin gets locked up in a cell and has to beg to Maroni to let him out. Cat and Ivy start their off and on again friendship. The two supervillains frequently team up which one of them double crossing the other. It was a nice touch for them to break into Jim Gordon’s apartment to find shelter from the rain. However, Barbra Kern as a storyline needs to be cut from the show. She is not a strong female character but super weak and needy. Her screentime is a problem because no one wants to see Barbra spend time in bed with her former lover. Overall, this Gotham’s episode was fun. There was some great chemistry between Gordon and Thompkins. The episode also left with a cliffhanger with the villain, Electrocutioner, terrorizing Gotham. This episode of Gotham gets a 4/5.